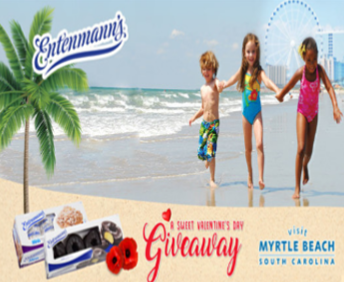 Entenmann’s® Visit Myrtle Beach Sweepstakes – Win a trip to Myrtle Beach! Win a trip to Myrtle Beach, SC! ELIGIBILITY – Sweepstakes is open to legal residents of the United States and the District of Columbia who are 21 years of age or older as of date of entry. SWEEPSTAKES ENTRY PERIOD – The Entenmann’s Visit Myrtle Beach Sweepstakes (the “Sweepstakes”) starts on January 17, 2019 at 8:00 a.m. Eastern Time (“ET”) and ends on February 14, 2019 at 11:59 p.m. ET. PRIZES – GRAND PRIZE (1): Winner will receive a trip that includes three (3) nights, four (4) days oceanfront hotel accommodations for themselves and up to three (3) guests (one (1) adult guest and two (2) minor guests up to a total of four (4) people) in Myrtle Beach, SC within the 2019 calendar year, with the exception of limited blackout dates (hotel chosen by Visit Myrtle Beach). The trip also includes roundtrip, coach class air transportation for winner and up to three (3) guests from a major U.S. gateway airport near winner’s residence to a Myrtle Beach, South Carolina area airport, four (4) tickets to the Broadway Grand Prix, four (4) tickets to the SkyWheel at Myrtle Beach, and a $50 dining credit. Approximate Retail Value (“ARV”) of each Grand Prize package: $2,599. Blackout dates apply to the weekends before and after Easter and the months of July and August. Most hotels in the area require one (1) guest to be 21 years of age or older to check-in. WINNER’S LIST – For the names of the winner (available after February 26, 2019) send a self-addressed, stamped, envelope by March 26, 2019, to: Retail Sports Marketing, Inc., P.O. Box 481925, Charlotte, NC, 28269, USA, Attn: Entenmann’s Visit Myrtle Beach Sweepstakes.